SUP Spokane's Lacy Gannon enjoys a quiet moment on Newman Lake. During one hot summer, Lacy Gannon and Sara Murphy were looking for a workout alternative to yoga. Wanting to avoid getting cooped up in a stuffy studio room, the two searched for an alternative. Their discovery: SUP (stand up paddle boards). Essentially, SUP involves standing on a surfboard-like craft and maneuvering it on the water with an oar or paddle. "Once you feel what it's like to stand up on water, it's almost like life changing," says Gannon. "It's a different view from the water than a kayak. For me, you look down at the water and it's more mesmerizing than looking out." 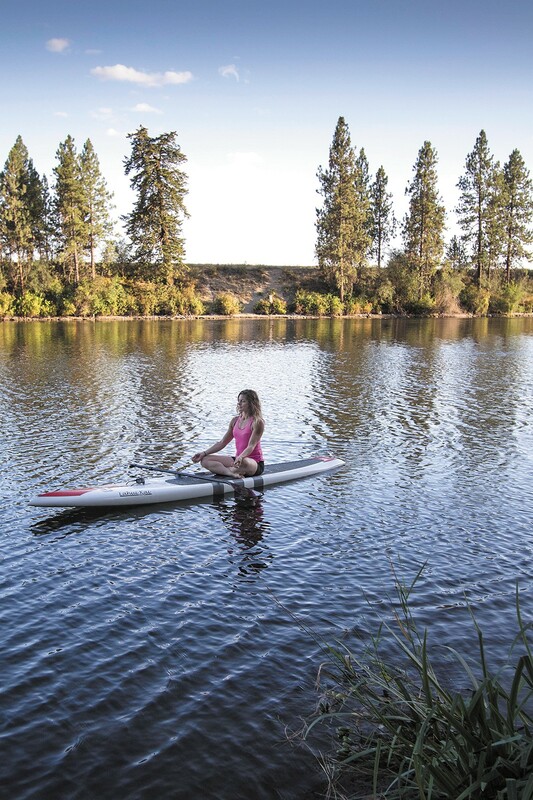 After piquing the interest of others, the duo formed SUP Spokane in 2014 and offer a yoga class taught on paddle boards on various lakes in the area. Gannon says that the sport has grown in popularity in the Inland Northwest due to the huge number of lakes and rivers people have access to. They're simple enough to launch and can reach places boats can't. One of the appeals of SUP is the ability to cool off without totally getting wet. "It's nice because they're not fully submerged in the water," says Gannon. "So you're not freezing cold from being in the lake but you're still getting that refreshing water splashed up on you." When it comes to the health benefits, Gannon goes on to describe the workout the sport provides. "You're pretty much getting toned every second you're out on the water. It's a good way to get in shape," says Gannon. Paddle board rentals are $40 a day with a mandatory $600 deposit. No delivery service. The original print version of this article was headlined "STAND & PADDLE"